An 1828 painting of the bank by J.R. Orton after a print by George Rowe of Cheltenham. The figure in the doorway is almost certainly intended to be Jemmy Wood. In the collection of Gloucester City Museum & Art Gallery. An 1814 banknote from Gloucester Old Bank. A print by George Rowe depicting Jemmy Wood with the Gloucester Old Bank in the background. The Gloucester Old Bank was a British bank that operated between 1716 and 1838. It was founded in 1716 by James Wood. The bank was said to have been the oldest private bank in Britain, having survived the financial consequences of the Napoleonic Wars when many other banks went out of business. The claim was wrong as both C. Hoare & Co and Child & Co. were founded earlier, it was, however, one of the oldest banks in Britain in the nineteenth century. At some point in the nineteenth century the bank became the Gloucester City Old Bank. In 1838 it was taken over by the County of Gloucestershire Banking Company which eventually became part of Lloyds Bank. After the death of the first James Wood, the bank passed to his son Richard Wood and on his death in 1802 to James (Jemmy) Wood,who was also known as the Gloucester Miser. The bank reached its apotheosis under Jemmy, whose practice was to offer no interest on deposits of less than one year. At that time, the whole bank was believed to have consisted of just Jemmy and two clerks. Counterfeit coins were nailed to the counter as a warning to customers not to try to pass them off on the bank. The bank premises were a medieval timber building at 22 Westgate Street, Gloucester that remained until the nineteenth century, and consisted of a counter within a larger draper's shop. The old building once occupied by the bank was subsequently replaced with a Victorian Gothic building and more recently with a new building. It is now occupied by a McDonald's restaurant. The bank was taken over by the County of Gloucestershire Banking Company in 1838, which eventually became part of Lloyds Bank in 1897. The bank was just one of several small banks in Gloucester including the similarly named Gloucester Old Bank, and the Gloucester Bank which was owned by John Merrol Stephens. Many provincial British towns had their own banks in the eighteenth and nineteenth centuries but their notes were usually only good in their home town. ^ a b c "Jemmy Wood's Journal" by Irvine Grey in Transactions of the Bristol and Gloucestershire Archaeological Society, Vol. 90, 1971, pp.158-177. ^ James Wood's Time Line. corseandstaunton.org.uk, 2005. Retrieved 1 July 2011. ^ Banknote for Gloucester from 19th century for sale. This is Gloucestershire, 21 September 2010. Retrieved 3 July 2011. Wikimedia Commons has media related to Gloucester Old Bank. Savory, Charles H. Life and Anecdotes of Jemmy Wood, the eccentric banker, merchant and draper, of Gloucester. Also an account of the remarkable trial with reference to his will.. London & Cirencester: Kent & Co., 1883. Gloucester is a city and district in Gloucestershire, in the South West of England, of which it is the county town. Gloucester lies close to the Welsh border, on the River Severn, between the Cotswolds to the east and the Forest of Dean to the southwest. Blossom Park is a neighbourhood in Gloucester-Southgate Ward in the south-end of the city of Ottawa, Ontario, Canada. Before the 2001 city of Ottawa amalgamation it was a suburb of the city of Gloucester. The current limits of the neighbourhood are: Hunt Club Road to the north, Airport Parkway to the west, Conroy Road to the east and the Greenbelt to the south. Lloyds Bank plc is a British retail and commercial bank with branches across England and Wales. It has traditionally been considered one of the "Big Four" clearing banks. The bank was founded in Birmingham in 1765. It expanded during the nineteenth and twentieth centuries and took over a number of smaller banking companies. In 1995 it merged with the Trustee Savings Bank and traded as Lloyds TSB Bank plc between 1999 and 2013. Brockworth is a village and district of Gloucester in Gloucestershire, England, situated on the old Roman road that connects the City of Gloucester with Barnwood. It is located 4 miles southeast of central Gloucester, 6 miles southwest of Cheltenham and 11.5 miles north of Stroud. The population taken at the 2011 census was 7,387. Gloucester is a constituency centred on the cathedral city and county town of the same name, represented in the House of Commons of the UK Parliament by Richard Graham of the Conservative Party. Hardwicke is a village on the A38 road some 4 miles / 7 km south of the city of Gloucester, Gloucestershire, England. Despite its proximity to Gloucester, the village comes under Stroud (district) Council. The population of the village taken at the United Kingdom Census 2011 was 3,901. Quedgeley is a suburban town or modern village suburb 3.5 miles southwest of the city of Gloucester, England. A thin strip of land between the Severn and the Gloucester Ship Canal occupies the west, and the south-eastern part of the town is Kingsway Village, directly to the north of which is Tuffley. Arlingham is a village and civil parish in the Stroud District of Gloucestershire, England. The 2001 Census recorded a parish population of 410, increasing to 459 at the 2011 census. The parish contains the hamlets of Milton End, Overton and Priding The next parish to the east is Fretherne with Saul. Down Hatherley is a civil parish and village in Tewkesbury (borough) between Cheltenham and Gloucester, Gloucestershire. It has approximately 165 houses and a population of 450, reducing to 419 at the 2011 census. The village is situated approximately 3.5 miles northeast of Gloucester city centre. Lloyds Banking Group plc is a major British financial institution formed through the acquisition of HBOS by Lloyds TSB in 2009. The Group's history stems from the founding in 1695 by the Parliament of Scotland of the Bank of Scotland, which is the second oldest bank in the United Kingdom. The Group's headquarters is located at 25 Gresham Street in the City of London and its registered office is on The Mound in Edinburgh. Lloyds Banking Group's activities are organised into: Retail Banking ; Commercial; Life, Pensions & Insurance; and Wealth & International. Lloyds' has extensive overseas operations in the US, Europe, the Middle East and Asia. Joh. Berenberg, Gossler & Co. KG, commonly known as Berenberg Bank and also branded as simply Berenberg, is a Hamburg-based multinational full-service investment bank. It was founded by the Flemish-origined Berenberg family in 1590 and is the world's oldest merchant bank and also the world's oldest or second oldest bank, depending on the definition. Its owners, the Berenberg/Gossler family, belonged to the ruling elite of Hanseatic merchants of the city-republic of Hamburg and several family members served in the city-state's government from 1735. Like many other merchant bankers, the Berenbergs were originally cloth merchants. The bank's name refers to Johann Berenberg and his son-in-law Johann Hinrich Gossler, and has remained unchanged since 1791. The bank has operated continuously since 1590 and is still part-owned by members of the Berenberg-Gossler family. Sir Matthew Wood, 1st Baronet was a British Whig politician and was Lord Mayor of London from 1815 to 1817. St Mary de Lode Church is a Church of England church immediately outside the grounds of Gloucester Cathedral. It is believed by some to be on the site of the first Christian church in Britain. The church is in the Diocese of Gloucester and Grade I listed by English Heritage. It has also been known as St. Mary Before the Gate of St. Peter, St. Mary Broad Gate and St. Mary De Port. 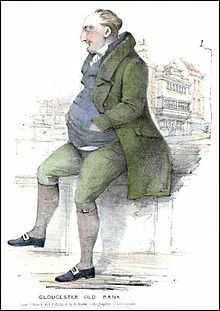 James (Jemmy) Wood was the owner of the Gloucester Old Bank who became nationally known as "The Gloucester Miser". His wealth of around £900,000 was stated at the time to have made him "the richest commoner in His Majesty's dominions". The Westgate area of Gloucester is centred on Westgate Street, one of the four main streets of Gloucester and one of the oldest parts of the city. The population of the Westgate ward in Gloucester was 6,687 at the time of the 2011 Census. The Old Wye Bridge or Town Bridge at Chepstow, also known historically as Chepstow Bridge, crosses the River Wye between Monmouthshire in Wales and Gloucestershire in England, close to Chepstow Castle. Although there had been earlier wooden bridges on the site since Norman times, the current road bridge was constructed of cast iron in 1816 during the Regency period, by John Rastrick of Bridgnorth, who greatly modified earlier plans by John Rennie. 9 and 9A Southgate Street is a 17th-century Jacobean timber-framed merchant's house on Southgate Street, Gloucester. It has been a Grade I listed building since 23 January 1952. 9 Southgate Street is now occupied by Costa Coffee and 9A Southgate Street is occupied by The Tiger's Eye restaurant. George Worrall Counsel was a Gloucester solicitor, antiquarian, alderman, and property developer.